Originally published in 1973, this book is a reflection of the alternative lifestyles that were cultivated in the 1970s. Tassajara is the location of the Zen Mountain Center, a Zen Buddhist practice centre founded in 1967. The book is a reflection of the Tassajara approach to vegetarian cooking which emphasises the relationship between food, life and spirituality; preparing, cooking and cleaning not as a chore but as a daily ritual that satisfies and nourishes both literally and metaphorically. The design of the book emphasises this spiritual aspect with its calm and considered design. The design of the book feels very of its time: the brown ink and cream paper; the choice of Baskerville and Antique Olive; and the simple line drawings all place the design of this book in the 1970s with its preoccupation with the hand-made and natural. This is a book that is a pleasure to read: the tactile quality of the paper and its relative lightness make it comfortable to hold; the clear typography and the charming line drawings invite the reader to read; and the rational hierarchy of the typography makes the recipes easy to follow. 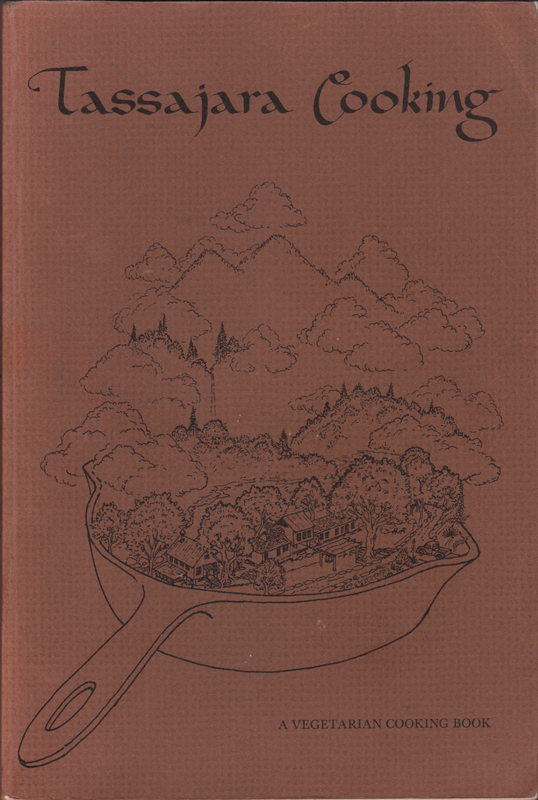 I would argue that, unlike many contemporary cook books, this a book that was designed for reading and for cooking: the tone of the book, amplified by the design, speaks directly to its audience, gently explaining the Tassajara approach to cooking, inviting the reader to share in the pleasure of preparing, cooking and eating food. The cover is printed in one colour on an uncoated, textured mid-brown card. The card is fairly light and is pleasing to the touch; it feels like pastel or watercolour paper and brings connotations of art or craft and a sense of the homemade. 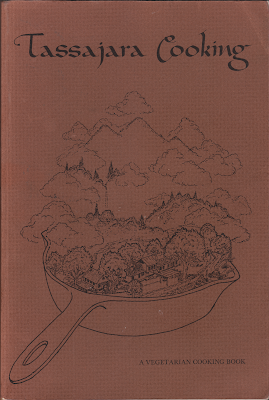 The dominant element on the cover is a line drawing, by Dan Welch, of a skillet pan which, on first glance, appears to hold food with steam rising from it; a closer inspection reveals that the ‘food’ is, in fact, a landscape. The landscape contains what could be a farm – a collection of buildings with pitched roofs: a farmhouse, barns and outbuildings. A pick-up truck is parked in front of the buildings. The buildings are surrounded by large trees, with full foliage, which lead the eye into a landscape with more trees, a river and, in the distance, mountains and a waterfall. The peaks of the mountains are obscured by clouds: the ‘steam’ from the frying pan. The drawing subtly and cleverly links cooking to nature – and to the landscape in which food is grown. The title of the book appears at the top of the page, arranged on one line and printed in black. It is set in a calligraphic swash typeface that mimics handwriting with an italic pen: initially, the title appears to have been handwritten but the uniformity of the characters suggests that this is a typeface rather than handwriting. The angle of the stresses of the typeface carry connotations of Indian or Arabic handwriting which, combined with the mountainous landscape, reminiscent of ‘Willow pattern’ china plates, gives an exotic Eastern flavour to the book cover. A subtitle, ‘A Vegetarian Cooking Book’ appears at the foot of the page, set in uppercase Baskerville, at about 14 point and printed in black. There are no other elements to distract from the simplicity of the cover: the author’s name and the publisher appear on the spine. The book measures 15 cm by 22.5 cm, a size that is more often found in paperback fiction. It is printed one colour, a subtle brown, on a cream uncoated paper with a slight texture; like the choice of cover paper, this paper carries with it connotations of art and craft. The book is set in Roman and italic Baskerville with Antique Olive for chapter headings: a calm and considered typographic hierarchy has been set up throughout the book with Baskerville used in just three sizes. The largest size of Baskerville is used to mark the sections in each chapter – these sections are about techniques or types of food – vegetable, fruits, grains, pulses etc. Ranged right italic Baskerville is used under the section headings to list varieties within the types – ‘Cantaloupe, Honeydew, Casaba, Crenshaw, Watermelon’ appear under ‘Melons’. Within the sections, Baskerville at a smaller size than the chapter headings but bigger than the body text is used to highlight each recipe. Baskerville has a warm and friendly appearance – it also, as a san-serif, largely used for books, carries connotations of authority: as readers, we can believe that the information contained in the book has validity. 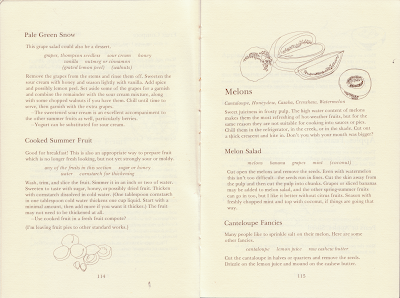 As you might expect from a Zen cook book, the recipes themselves are very simply written – and the typography reflects this: beneath the title of the recipe is a short, usually one-line commentary, about the dish followed by a list of ingredients which is set in italic Baskerville and centred (a subtly different treatment to differentiate between ingredients and varieties). The method appears beneath the list of ingredients, it is not ‘announced’ in the traditional manner with the word ‘method’ nor are the stages of the recipe numbered or bullet pointed: the recipe is written as prose, in short, precise sentences and the typography reflects this. Beneath some of the recipes are suggestions for variations which are highlighted with indented em dashes; this highlights the information as different but does not shout its presence to the reader. All text – body text, chapter headings, section headings – is ranged left, ragged right with no hyphenation, creating a ‘natural’ reading experience akin to reading handwriting. There are no photographs in the book, instead line drawings are used extensively throughout to illustrate the type of food being discussed and, importantly, to show techniques – how to correctly hold a knife to finely chop herbs, for example. The drawings punctuate the text and are usually printed at a fairly small scale – generally not bigger than 5cm. The images are sometimes inserted into the text with the text wrapped around the image; this adds variety and rhythm but it disrupts the reading experience with oddly hyphenated words and very short sentences. 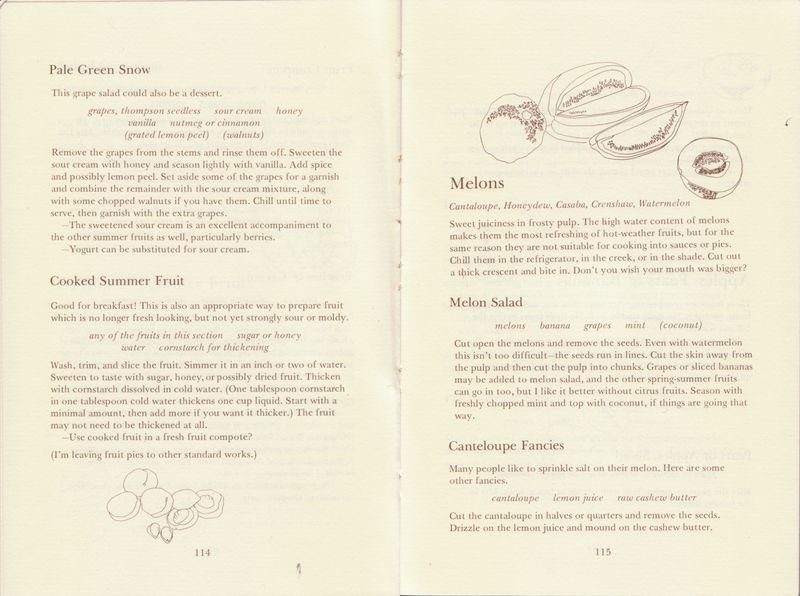 The images are visually appealing – simple line drawings with no shading; they contain just enough detail to reveal a particular technique or the peculiarities of a type of food; and they have a quiet confidence that, along with the considered typography, helps instil confidence in the reader, suggesting that the writer is an authority on his subject and that the recipes will work. The book contains a wealth of material other than recipes: a ‘Beginning’ section outlines how to use and care for knives with illustrations that show the correct way to hold a knife and how to slice different vegetables. A further section explains different cooking methods. A chart with a nicely considered typographic hierarchy shows when vegetables are in season; in the book, vegetables are grouped first by the season in which they reach maturity and secondly by what part of the plant is the edible portion: root, stem, leaves, fruit or bud. Further sections deal with planning meals and with organising and cleaning a kitchen. All are written in a tone that is calm and respectful to ingredients, utensils and to fellow humans; this tone is amplified by the considered simplicity of the typography of the book and through the choice of paper which is soothing both to the eye and to touch.